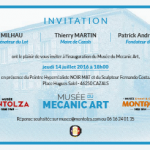 The Museum of Mecanic Art at Cazals is reinventing itself by merging the Montolza Museum (1868-1969), the Montaut Museum (1903-1914) and the Mecanica collection of contemporary artists! We propose a voyage of discovery through time. 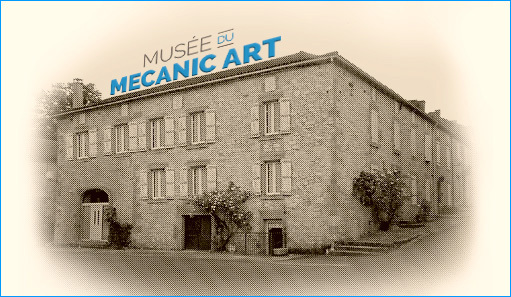 Experience the first museum dedicated entirely to artists of Mecanic Art, an international artistic movement born in France in the 19th century. Travel through time as the works of art chronicle the birth and evolution of the new industrial civilisation and transportation. From 1868 to today, you will be introduced to the first velocipede, you will discover the works of Ernest Montaut and his wife Gamy, the parents of ‘motor speed’ and Mecanic Art illustrations. Opened in February 2014, the Mecanica Gallery promotes artists from the Mecanic Art movement. All forms of expression are represented by the gallery: paintings, sculptures, photographs etc. The artists on display are from all the periods and trends of Mecanic Art. From the Montaut couple to Peter Klasen, to Nys, Mecanica Gallery sets out to defend these artists and shine a spotlight on a contemporary art movement accessible to a wide public. 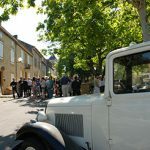 Mecanica Gallery was founded by Patrick Laubie who, for the past twenty years, has been visiting galleries, studios and workshops in search of artistic talent in the mechanic art field; artists who are able to blend art with the human genius for technology. Mecanica Gallery is located in Paris, Saint-Cirq-Lapopie ( VILLAMECANICA) and Los Angeles.